Let's have our first contest of the Year, shall we? 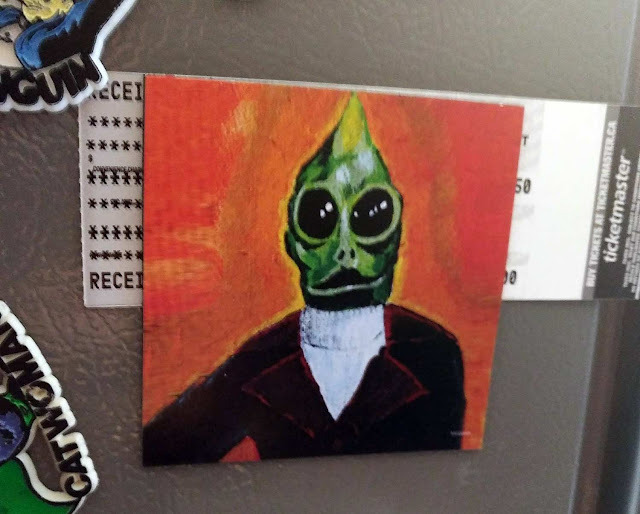 A couple of months ago, I made a bunch of these kitchen magnets made featuring some art I did called the Gentleman Sleestak. There really wasn't a plan in motion but I knew they'd make a fun contest prize. So, I'm giving away five of these this weekend to some nice folks who post their reply to the PlaidStallions Facebook page or to the Forum at the MegoMuseum. The question is: What thing scared the hell out of you as a kid that you're now kind of fascinated with as an adult? I'll pick five names randomly from those answers and send them this plucky magnet and a mittful of PlaidStallions Trading cards. Thanks for playing, here's to a fun weekend! The Sleestak scared me when we did scenes with them on LAND OF THE LOST!!!!!! They were actually 10” tall being basketball players on big shoe lifts and a pointed hear!!! Satan related horror films, going to Catholic school for the first 10 years of my education. So as a 42 year old woman, I recently read "The Exorcist" by William Blatty and listened to "Inside the Exorcist" podcast. Creeped me out but I'm not possessed yet!